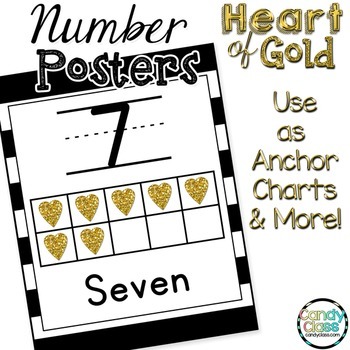 These number posters are super versatile and designed to match my heart of gold classroom organizers and decors. These are included in my classroom decor bundle that you can find here. Not only can you use these as wall references and for introducing numbers, but did you know you can change your pdf print settings (instructions in preview and in the resource) to print 4 posters per a page for playing card games and more? You can also project this pdf on the board with a projector and scroll through them. 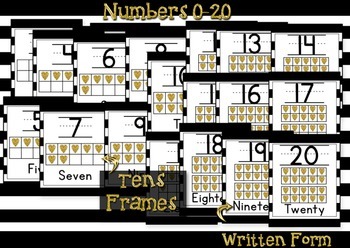 These number posters consist of 21 posters covering numbers 0-20. It also includes the directions on how to print four or more per a page. Please note, this resource comes in a non-editable and easy to print pdf. These number posters are for personal use only and one license is for one classroom. Multiple licenses may be purchased for a discount. For extra discounts on district licensing, please contact me at teachcandyclass@gmail.com. Also note, the phrases on the cards combine to form a poem, so they are protected by copyright.